This year the UK plays main protagonist at the 13th Biennale of Architecture in Venice. The role of director of the architectural sector has gone to British architect David Chipperfield, famous for national and international projects such as The Turner Contemporary Gallery in Kent, theHepworth Wakefield Gallery in Wakefield and the Neues Museum in Berlin. As usual the event is housed in the prestigious and historical setting of the Arsenale, the largest pre-industrial production centre in the world, covering an area of forty-six hectares. An important cultural signpost for Venice, seen before as a symbol of military, economic and political power, it is now the heart of art, architecture and cultural events. I Giardini in the east of the city, plays host to the Central Pavilion and a further 29 national pavilions, built by architects such as Aalto,Hoffmann, Rietveld, Scarpa and Stirling. The topic proposed this year by Chipperfield is Common Ground — “to reassert the existence of an architectural culture, made up not just of singular talents but a rich continuity of diverse ideas united in a common history, common ambitions, common predicaments and ideals”. It is interesting to note a common theme connecting this and last year’s Biennale, curated by Japanese architect Kazuyo Sejima, entitled People Meet in Architecture. Now, it seems, is the right time to reflect upon the different approaches, values and ways to view architecture, as described in the last Biennale. Aberrant Architects emphasised in our interview with them, that the UK Pavilions at Venice Takeaway reflect on what we can learn from different cultures. Countries like the UK are increasingly looking for unexpected inspiration and solutions from exotic cultures to resolve societal and architectural problems. Among the ten practices selected to show their works are Darryl Chen’s study of Caochangdi – a village on Beijing’s Fifth Road, looking at parallels between the UK and China; dRMM’s study of IJburg, a floating community to the east of Amsterdam and Elias Redstone’s investigation of Fideicomiso in Argentina, a legal trust that enables architects to fund their own projects. Countries with outwardly nothing in common, such as Chile and Japan, are now learning how to deal with shared problems. 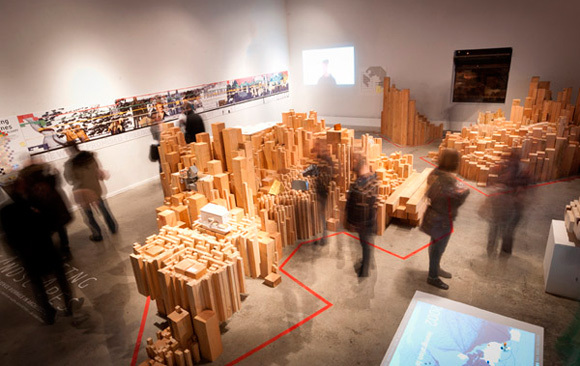 In 2010 Chile showed in its Pavilion Chile 8.8 Rebuild the Future, a range of projects reflecting on the reconstruction of the country after the terrible devastation caused by the earthquake of that year. This year Chile is back at the Biennale taking inspiration from a similar theme. Cancha: Chilean Soilscapess is a discussion between seven architects reflecting on what constitutes Chilean ground and territory. In March 2011 a similar fate befell Japan. Their pavilion this year will be curated by Toy Ito in collaboration with Kumico Inui, Sou Fujimoto and Akihisa Hirata on the theme of “architecture in the wake of disaster”. Titled Home for All, the project is a reflection on the destruction of a community and the attempts of architects to design new all-purpose places of refuge for the displaced and homeless. The preoccupations of this Biennale represent a need for reflection on the daily problems of society instead of just abstract theorization concerning shape and form. That is not to say we should consider these frivolous elements of architecture that act only as embellishment. But perhaps they are secondary at a time when architecture has to deal with societal problems that spring from economic crisis and with all the contradictions that come with quick development, such as that seen in South America.